In a nutshell, it's a tool that lets you map your flights around the world, search and filter them in all sorts of interesting ways, calculate statistics automatically, and share the resulting maps with friends and the world. You can also check airport route maps for nearly every airport in the world and find out what airlines fly where. What can I do with OpenFlights? See at a glance where you've been and where you're going. Rapidly search your flight history: now when did I go to the Bahamas, and on what airline? Share your flights and trips with friends. Why is OpenFlights better than other similar services? OpenFlights is user-friendly and efficient. Everything's on the same page! OpenFlights works in realtime. Make any change, and you'll see it right then and there. OpenFlights supports "trips" (read more). You can join up any flights together into a trip, which you can then display on its own page and even share with friends. OpenFlights is free in spirit. We don't try to lock you in: it's easy to import your data and export copies for safekeeping. OpenFlights is free software. All our source code is licensed under the GNU Affero General Public License and can be downloaded from GitHub, so you can set up your own copy or just use the bits you like. Airport, airline and route data is freely available as well. Developed on Firefox and Chrome, seems to work for most (but not all) people on Internet Explorer and Safari as well. Unfortunately the site does not work well on tablets due to screen size limitations. If it works or breaks on anything else, please let us know, and please do include your exact browser version, operating system and screen size. Using the website costs you absolutely nothing. However, our meager advertising revenue does not currently suffice even to pay for our bandwidth bills, so if you like the site, you're warmly encouraged to donate and help keep the site running. Donors receive "Elite" status with perks like no ads, password-protected private profiles, elite-level support, previews of upcoming features and more. See Donate for more. Are you sure this thing will scale? Yes! The heavy lifting of drawing the maps is handled by your browser, not any central server. The database is built to scale up and already has over 1,500,000 flights and routes loaded. How do I start punching in my own flights? Just click on Sign up and pick a username. Your account will be created instantly, no e-mail confirmation or other tiresome hassles needed. Why do half the airports disappear when I scroll around from the Americas to Asia or visa versa? This is a bug/missing feature in the mapping system we're using. Sorry. Why aren't the flight paths smoothly curved, especially up near the poles? That would be hard to draw fast, so we cheat and chop them up, one segment per every 500 mi. Flights under 1000 mi are shown as straight lines. The distances for the statistics, though, are calculated correctly as great circle distances. Are those flight time estimates accurate? Can I enter my own? The site currently uses a really fancy formula to calculate them: "30 min plus 1 hour per every 500 miles". This seems to be a surprisingly good approximation for commercial flights (anything from 100 to 10000 mi). And yes, you can enter your own flight times, either as arrival and departure times, in which case OpenFlights will figure out the duration taking into account time zones and DST, or directly into the duration box. See Help: Time for details. Why is my favorite airport/heliport/patch of grass missing? If you can't find your airport right away, click on the or icons to launch the advanced search. If you're looking for a decommissioned airport, you may need to use the ICAO code instead of the IATA code. For example, ATH points to Athens-Eleftherios Venizelos (LGAV), but you can still find Athens-Ellinikon as LGAT. If the main OpenFlights DB doesn't have it, try a search in the OurAirports database with the airport's name or ICAO code. If you find it in OurAirports, click to load its data, double-check that it all looks correct, and then to copy it over. If you still can't find it, you can click on while creating a new flight to add your own airport. You can also enter heliports, landing strips and other informal airports which do not have IATA or ICAO codes, just leave the IATA/ICAO fields blank and click "OK" when warned about it. Why is the route map missing the Rutungu Airlines flight from Mambo-Jambo to Bingo-Bongo? Our route data is provided by Airline Route Mapper, please let them know your suggestions and corrections. Your calendar only goes back to 1970, how do I enter an earlier flight? Just enter the date manually instead of using the calendar widget. How do I delete an airport/airline/trip that I no longer need? For airports and airlines, just remove all flights using it, and it will stop appearing. To delete a trip, load it in the Trip editor and select Delete. Any flights still in that trip will be kept, they will just set as tripless. How do I share my flight map with friends? Point them to http://openflights.org/user/yourname. You can also click on when logged in to find your address; this is particularly useful if your name has spaces or unusual characters. To get pregenerated banner code for blogs (HTML format) and for bulletin boards (phpBB), just log into your account and click on . Can my friends also edit my flights? Yes, if you give them your password. You'd better trust them though, since they can now change all your settings and even delete your flights. While the system does not officially support being logged in as the same user from many places at once, in practice this is unlikely to cause problems. Something went wrong when I imported from FlightMemory! This most often happens with airlines, since FlightMemory and OpenFlights do not render all company names in the same way. 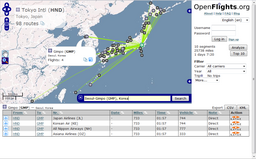 OpenFlights also uses current airline data, not historical, so eg. SN123 will be mapped to "Brussels Airlines", not "Sabena". To keep the old airline names exactly the way you had them on FlightMemory, check Keep historical airline names? when importing. The other common source of headaches is unofficial airports like heliports and landing strips, which do not have IATA/ICAO codes. These have to be entered manually into OpenFlights using "Add new airport" before you can import. Note that the matching is done based on the first word of the airport name, so make sure the one in your data matches the one you enter exactly. If anything else goes wrong during importing, or if a current airline is being mapped wrong, it's a bug and we'd like to know about it. Drop us a line, tell us exactly what went wrong, and (this is important) give the "Tmpfile" value from the top of the import page so we can replicate it. You really need to implement cool feature X, and fix terrible bug Y, and do it right now! Please check the GitHub issue tracker to see if they're already reported, and add them if not. But remember, this is open source, so the best way to get anything done is to do it yourself! Bug reports from people who have donated to the site also get priority. You said feature X was implemented/bug Y was fixed yesterday, but I don't see it! Your browser probably has an old version still in memory. Please hit Control-F5 to force it to reload the entire page. Did you really code that map all by yourself? No sir, the credit goes to OpenLayers. We just added the fluff on top. Can I get a copy of your airport, airline or route data? Yes! See Airport, airline and route data for free downloads and more information. I want to export to/import from OpenFlights format. Where is your CSV specification? Right here: Help: CSV. It's pretty straightforward, but let us know if something is not working the way you expect. One common problem: OpenFlights exports special characters in UTF-8 format, which is not automatically recognized by some versions of Excel. Use the Text Import Wizard and specify "Unicode (UTF-8)", and they will import nicely. Can I use your images in my book/magazine article/annual report? Yes, but commercial use requires a license, please contact us for details. Can I have an anonymized dump of flight data from OpenFlights or a customized installation for my airline/airport/website/other company? We'd be delighted to work out a deal for consulting work, just drop us a line.